Over the past two years, Americans have become more likely to say it is “stressful and frustrating” to have political conversations with those they disagree with. 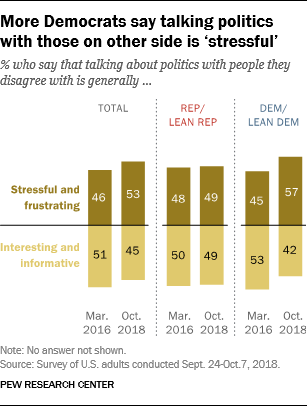 The change in opinions has come largely among Democrats: 57% now say that talking about politics with people they disagree with is stressful and frustrating, up from 45% two years ago. By contrast, Republicans’ feelings about political conversations with people they disagree have changed very little. About half (49%) continue to find such conversations stressful and frustrating. Overall, 53% of Americans say talking about politics with people they disagree with is generally stressful and frustrating; fewer (45%) say such conversations are usually “interesting and informative.” In March 2016, during the presidential primaries, slightly more found such conversations interesting and informative (51%) than stressful and frustrating (46%). The national survey by Pew Research Center, conducted Sept. 24 to Oct. 7, also finds that a majority of Americans (63%) say that when discussing politics with people they disagree with they find they usually have less in common politically than they thought. Views of whether such conversations lead to more common ground politically – unlike opinions about whether they are informative or stressful – do not differ by partisanship. Majorities in both parties say they find they usually have less in common politically when discussing politics with those who have differing views. In both parties, there are ideological differences in views of whether conversations with those they disagree with politically are stressful or not. 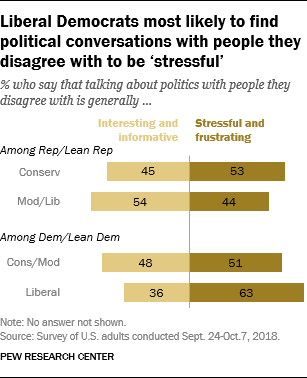 Among Democrats and Democratic-leaning independents, 63% of liberals say such conversations are stressful and frustrating, compared with 51% of conservatives and moderates. Among Republicans and Republican leaners, somewhat more conservatives (53%) than moderates and liberals (44%) say it is stressful to discuss politics with those they disagree with. A majority of Americans (63%) say that when they talk about politics with people they disagree with, they usually find they have “less in common” politically than they thought previously. Fewer than a third of Americans (31%) say they find they have more in common with people they disagree with politically. These opinions have changed only modestly since 2016, when 63% said that when discussing politics with people they disagreed with, they had less in common than they thought. 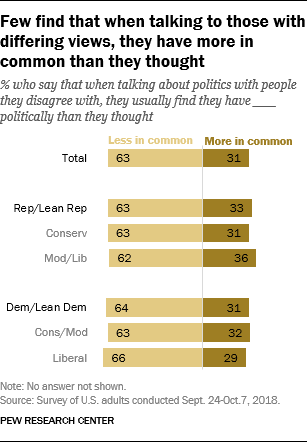 There is little division across the partisan and ideological spectrum: More than six-in-ten in each group say they find that when they discuss politics with people they disagree with, they usually find they have “less in common” politically than they thought. Currently, a majority (62%) of Americans say Donald Trump’s presidency and policies come up very often (25%) or somewhat often (37%) in conversation. Far fewer (38%) say Trump comes up not too often or not at all often. That is similar to people’s views of how often Trump came up in conversation in December 2016, shortly after his presidential victory. At that time, 25% said Trump’s election and plans for his presidency came up in conversations very often, while 40% said they were topics somewhat often. As was the case in late 2016, Trump is a more frequent topic of conversation for liberal Democrats than for other Democrats or among Republicans. 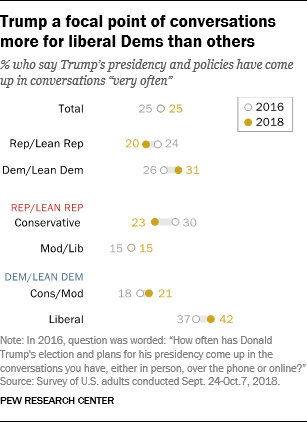 Currently, 42% of liberal Democrats say Trump’s presidency comes up in conversations very often; that is double the share of conservatives and moderates who say this. Among Republicans, Trump comes up more in conversation among conservatives (23% very often) than among GOP moderates and liberals (15%). The share of conservative Republicans who say Trump comes up very often in conversation has slipped since 2016, from 30% then to 23% now.